Time management and productivity tools for iOS, macOS and the web. TimeTag Team is TimeTag for businesses. Using the same app, you can collect all of your team's hours and activities in 1 place for easy exporting and analysis. TimeTag Team is the exact same app as TimeTag--which means you gain all the benefits of the simplicity of the app. On average, our clients train their employees to use TimeTag in a matter of minutes, not hours. Our average session length is 3 seconds long. That means your team members aren't spending valuable minutes (and hours) in the app--giving them more time to spend on their work. Know what your team members are doing as they work. View real time data as people check in and check out of their activities on their personal devices. 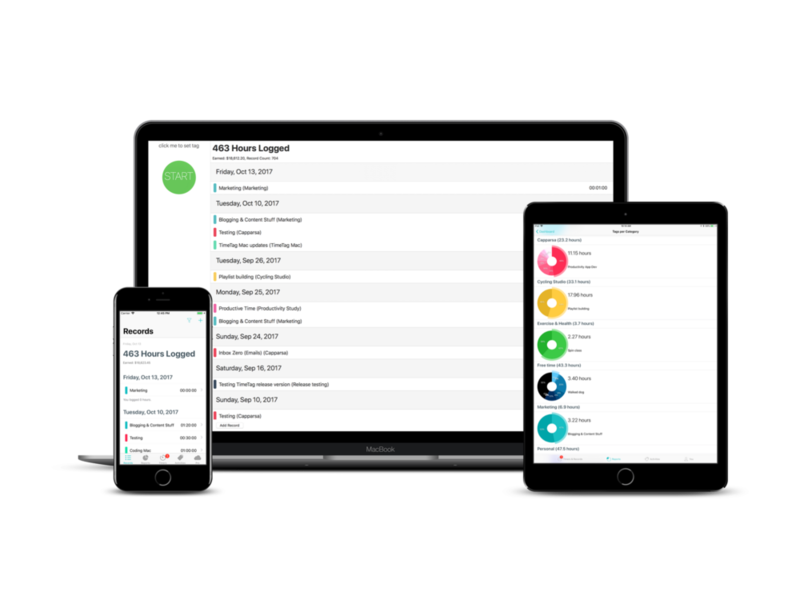 TimeTag Team also lets your employees clock in and clock out at a device, turning your iPad or iPhone into a digital punch-clock. Just like in TimeTag, your data is fully available to you any time. Export all your records as a CSV and import it into virtually any app. You can gain valuable insight into where most of your team member's time is being spent, and how to improve processes to reduce cost drivers. Your first 28 days of the service are free-- you can cancel any time (without talking to us!) and you won't be charged. After that, the cost for TimeTag Team is $10/member/month. Ready to give it a go? Click below to get started, and purchase your Team account. Let us know if you have any questions and we'll be happy to help! We can also set everything up for you and your business for an additional setup fee, and get you moving even faster. If you're interested in learning more about our options for rolling out TimeTag in your business, fill out the form below and we'll be in touch shortly! Thank you for your message! We'll be in touch soon! Download the app, and know where your time goes. No pen and paper, no guess work, and no spreadsheets. Yes to accuracy, yes to confidence, and yes to mobility.